“There are times when Golden Opportunities land in your lap!” This was the tagline adorning the Montego pet foods Audio Presentation Box – produced in partnership with The Neighbourhood – South Africa’s premier advertising agency. And that summed up our working relationship as well as the finished product. Originally approached about producing a VideoPak Presentation Box for Montego Pet Foods in SA as part of a campaign targeting wholesale and veterinary sellers to stock the Montego range. The budget would not stretch to the inclusion of LCD screens so we offered a cost-effective and creative solution. 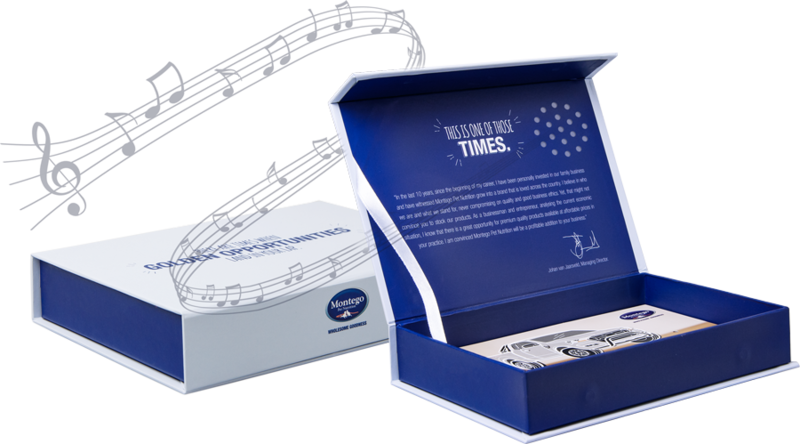 An audio chip with a message explaining the promotion, competition to win a Ford Ranger vehicle and the video animation included on a replica Ford key USB stick was fused into a bespoke sized paper over board presentation box. Montego were very happy with the response & also by the 32% increase in stockists throughout South Africa for 2016. It was activated via a light sensor when the presentation box was opened. Playing the message and revealing the USB stick held in a bespoke foam fitment, covered with a branded overlay. The entire box was printed, laminated and hand produced at our Ear East facility in 3 weeks, and then shipped to South Africa.